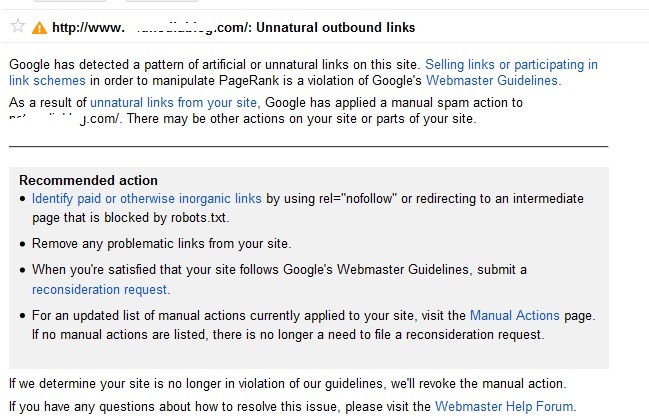 I have been meaning to write this report for awhile now but have been too busy with other things, glad i found time today to tell you How I survived Google manual penalty for Unnatural outbound links. Few months ago Netmediablog was slapped with a manual penalty by Google for Unnatural outbound links. Google alleged that i have been taking part in selling links or participating in link schemes in order to manipulate PageRank, which they seriously considered a violation of the Webmaster guidelines. I logged in to my Google Webmaster Tools only to see a notification by Google that a pattern of artificial or unnatural links was detected on my blog. My blog was demoted from PR3 to PR0 and i lost more than half of my top ranking keywords/pages on Google and my traffic dropped by half too, then i knew something was wrong and had to do something about it. Unnatural outbound links may not necessarily be because you sold dofollow links on your blog. I quickly reviewed the Google Webmaster guideline and compared it to my link building practice and immediately it hit me i have been passing link juice to external sites. Google believed passing link juice to an external link may be for some financial benefits. I agree i may have sold some links in the past via paid posts and reviews, granted guest posts with dofollow backlinks. I was raking in some serious $$$ from paid posts giving dofollow links in exchange to cash and never thought i was committing any crime. And then recommended i submit a reconsideration request after I am satisfied I must have removed such links from my site. 1. The first thing i did was identify all the possible means of giving out dofollow links on my blog, apart from the ones i granted within the content body, i discovered most of the dofollow links were in my comment area and author bios. So i quickly uninstalled CommentLuv Premium plugin which was one of the ways people were gaining dofollow backlinks from my blog. 2. Then i installed a called WP External Links. 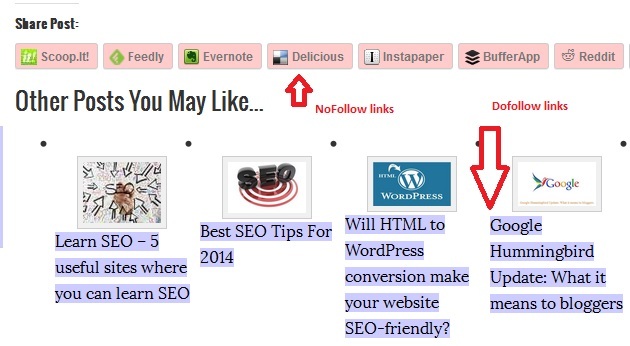 What this plugin does is to add “nofollow” attribute tag to all external links on a WordPress site while retaining dofollow for all internal links of your blog. 3. I didn’t end there, i searched around the internet for a way to remove author box from Genesis theme and found a cool snippet on StudioPress that globally removes author box from a Genesis theme. I simply added the code above to my function.php to disable author box from all published articles on my blog and all feature articles to be published. 4. I also made links within comments un-clikable by adding another snippet to my function.php. After i had taken all the above steps i ensured to check for dofollow links on my blog by installing a Firefox extension called ‘NoDoFollow 1.1‘. This extension ads a NoDoFollow command your mouse right-click, when you select it all the links on a page will be highlighted. See screenshot below, the purple highlighted links are nofollow while the grey highlighted links a dofollow which are my blog internal links. Now am certain i am no longer passing link juice, i knew it was time to submit that reconsideration request. I quickly went back to the Manual Penalty message in Google Webmaster Tools and clicked on the reconsideration request link. Google wants you to come clean of your crimes and reassure that you won’t commit same crime again. Google expects you tell them what you have done to fix the links that was passing juice to another site and what you have done to ensure it won’t happen again. So while writing your reconsideration request ensure to be truthful and explain in details what you have done to fix the problem and ensure it won’t reoccur. “I accept that there are links on my site that have been passing link juice to other sites. In the past i have granted guest posting opportunities and also allowed dofollow links in comment because i had CommentLuv premium plugin installed on my blog and also allowed dofollow links in author bios, there were the sources of my problem that lead to my site being penalized. 1. I have uninstalled the CommentLuv Premium plugin ensuring no one will ever gain dofollow backlinks from comments on my blog again. 2. I have installed WP External Plugin which adds ‘nofollow’ attribute tags to all external links on my blog. 3. I have also disabled author bio on my blog since this can also be a source of problem too. 4. For now guest posting has been suspended till further notice on my blog, i will ensure strict linking standard that meets the Webmaster guideline if i will ever allow guest post again on my blog. I will personally publish all guests post from my profile ensuring no dofollow links are allowed within the article body. I have also personally checked my blog extensively to ensure no external link has a dofollow attribute. 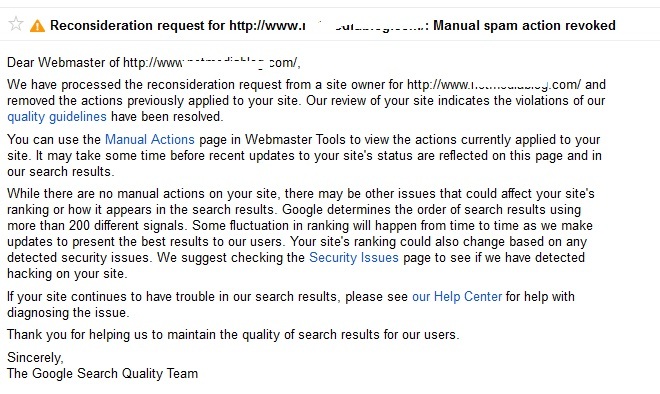 I hope to receive a positive response and promise to always abide by the Google Webmaster guideline always. Few weeks later i received another message on my webmaster tools that the manual spam action on my blog has been revoked. But that was not the end of my problem,i realized my blog PR was still Zero. Then i knew i had to be patient, because when you are dealing with Google you can only be patient. My blog remained a PR0 for over a month but i was confident it will be reinstated since i know i have been keeping to the guidelines. Maybe Google had to trust me again to give it back or they probably forgot, then one evening i was surfing through my blog when i realized its been reinstated. I was happy that i got my PR3 back but most importantly that I survived Google manual penalty for Unnatural outbound links. My traffic is long back and my blog is performing well once more. Now i have stated to all advertisers clearly that i only offer Nofollow links, if you insist on dofollow you can try somewhere else. This is how I survived Google manual penalty for Unnatural outbound links. You don’t have to wait till you are penalized by Google to implement same standard on your blog, ensure to make all external links ‘nofollow’ if you don’t want Google to slap manual penalty on you someday. If you use CommentLuv premium plugin you can as well make all links nofollow or do away with the plugin, since then comments have reduced on my blog, i certainly don’t care about that provided i keep churning high quality content that solves my audience problems. I learnt the hard way, i hop you learn the easy way from me and don’t get to wait till ‘Uncle Google’ visits you. You may not be as lucky as me. Nice case study shared I guess, Well I didn’t received any manual penalty for any of my blogs but this post is really beneficial to learn about how to recover from this unnatural outbound links. I read about it on Geek.ng and i guess we had similar problem and followed same approach to solving it. This approach surely works and anyone who follows it will most likely have his penalty revoked. Thanks for the tips you gave when i was penalized. Agreed I have heard about this issue and it can only be corrected by removing all unnecessary outbound dofollow links. Though making all outbound links nofollow is not right for genuine resources, but certainly safe for our own site. Instead of removing commentluv plugin, you can simply make all the links nofollow. 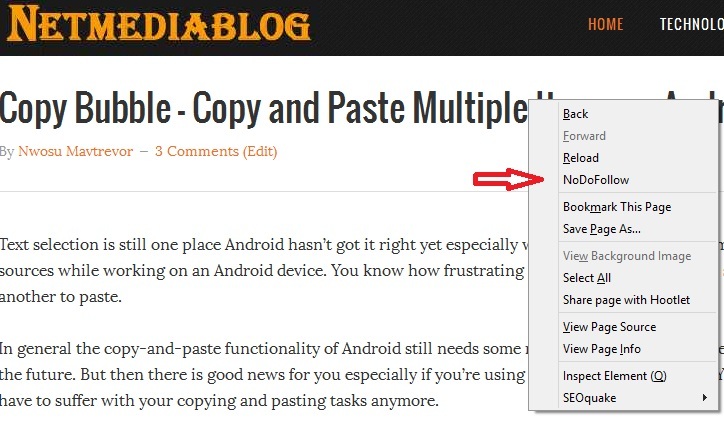 This way you won’t have to remove all the links, and you would be promoting valuable content of various bloggers. That’s my personal opinion!! however, you can still go with commentluv while maintaining the nofollow tag. This plugin doesn’t only help your commentators. It helps you when dropping comments on other blogs. That’s another magic it has. Yes, making your advertisers know before hand that the links will be nofollow is good way to go. This is for the benefit of both of you. Google, being the giant of the Internet World is almost setting the pace of us to follow. Do we have any option? I will probably put it back and make all link nofollow. Thanks for pointing that out. Yes we actually do if we can drive tons of traffic from other sources such as Social media but it will come at a very heavy cost. Yes i have reconsidered adding back the commentLuv premium plugin and will go with the nofollow tag. I had to remove it when i was desperate to save my blog.